Home » Answers to Jehovah’s Witnesses » Was the Bible corrupted until the New World Translation came along? Was the Bible corrupted until the New World Translation came along? Summary: Jehovah’s Witnesses profess to believe that the Bible is God’s word and preserved throughout the centuries since it was written. However, they also claim that it was altered by scribes who omitted the divine name Jehovah from the Christian Greek Scriptures (the New Testament) and by translators who distorted the Bible’s doctrines. What this inconsistent position means in practice is that Jehovah’s Witnesses believe the Bible as it is translated and interpreted by their leaders in the Watchtower Society. According to their official publications, “Jehovah’s Witnesses believe in the Bible as the Word of God. They consider its 66 books to be inspired and historically accurate.”1 However, their publications send mixed messages as to the reliability of the Bible. In context the Watchtower’s statement here is referring to a specifically Muslim notion that the teachings of Moses, David, and Jesus in the Torah, Psalms, and Gospel (note the singular) were corrupted over time, so that what we find in the Bible is a garbled, unreliable record of their teachings. Islam claims that this problem has been solved by the revelation through Muhammad of the Qur’an, which Muslims believe was not similarly altered or corrupted. The Watchtower rightly rejects that claim and rejects the premise of the theological corruption of the Bible on which it is based, at least in the form taught by Islam. In its handbook Reasoning from the Scriptures, the Watchtower provides Jehovah’s Witnesses with answers to questions they are likely to hear when they are engaged in proselytizing. One of these questions is, “How can we be sure the Bible has not been changed?” In reply, the handbook quotes from non-Watchtower scholars, notably Sir Fredrick Kenyon, in defense of “the integrity of our existing texts.” It also reports the fact that some six thousand manuscript copies of the Hebrew Bible and about five thousand copies of the Greek New Testament have survived to the present day.5 (The number of Greek New Testament manuscripts has since increased to about 5,800.) The point is that Jehovah’s Witnesses are taught to tell prospective converts that the Bible has not been changed and that doctrine can therefore be confidently based on quotations from the Bible. Elsewhere we address this claim that the name Jehovah originally appeared in the New Testament (what the Watchtower calls the “Christian Greek Scriptures”).9 The point here is that the Watchtower contradicts itself on whether the text of the Bible was changed in any substantial way. On the one hand, it denies that such change occurred, affirming that the text was copied accurately over the centuries. On the other hand, it asserts that such change did occur, in hundreds of places throughout the New Testament where the Watchtower claims the text originally contained the Tetragrammaton. Nor are these hundreds of changes considered minor or insignificant: they are said to be the work of Satan, leading apostate Christians to dishonor God by removing his name from the New Testament. In addition to scribes removing the Tetragrammaton from the Greek texts of the New Testament, Jehovah’s Witnesses complain that the divine name was removed from translations of the Old Testament. Again, we address this criticism of Bible translations elsewhere. Here the point must simply be made that if the Watchtower is correct, then for most of Christian history all readers of the Bible were reading apostate versions of the Bible. On its face, this is not a plausible claim. Moreover, it is inconsistent with the Watchtower’s claim that the Bible was reliably preserved down through the centuries. Much good has been accomplished by them [other translations] and will yet be. But honestly compels us to remark that, while each of them has its points of merit, they have fallen victim to the power of human tradition in varying degrees. Consequently, religious tradition, hoary with age, have been taken for granted and gone unchallenged and uninvestigated. These have been interwoven into the translations to color the thought. In support of a preferred religious view, an inconsistency and unreasonableness have been insinuated into the teachings of the inspired writings. Giving a biblical answer to the Jehovah’s Witnesses’ critical view of the Bible may seem tricky given their deep suspicions about versions of the Bible other than the NWT. Fortunately, the NWT itself can be used to show that the Watchtower’s claims are without any biblical foundation. In addition, the Watchtower’s factual assertions about the Bible (e.g., that the divine name was originally used throughout the New Testament, or that other versions are doctrinally unreliable due to pagan and apostate influences) can be refuted. Other articles on this website address these claims on a number of specific issues. As for what the Bible itself says about this matter, two observations are in order. 1. God’s word endures forever. The Watchtower claims that God’s word in the Bible was largely robbed of its power and effect by supposedly apostate scribes and translators. However, Isaiah makes a couple of statements that call this claim into question. “The green grass dries up, the blossom withers, but the word of our God endures forever” (Isa. 40:8 NWT). The Watchtower itself quotes this very verse in support of the point that “the contents of the Bible we have today truly reflect the original inspired writings.”15 After quoting Isaiah 40:8, the Watchtower magazine in 2010 commented, “We can have the same confidence that the One who inspired the Holy Scriptures also preserved them through the ages.”16 Isaiah also stated later, “So my word that goes out of my mouth will be. It will not return to me without results, but it will certainly accomplish whatever is my delight” (Isa. 55:11 NWT). The claim that for nearly two millennia God’s word in the Bible was not accomplishing God’s intended results because it had been badly corrupted by apostasy is inconsistent with Isaiah’s statements. 2. Partial apostasy. The claim that essentially every Bible in existence for most of church history was riddled with apostasy and gutted of its truth and power is incompatible with the New Testament’s teaching about apostasy. Jesus and the apostles did warn about false prophets, false teachers, and people falling away; however, this “apostasy” was to be partial, not universal. False prophets would be detected by their fruits and distinguished from the genuine followers of Jesus (Matt. 7:15-23). Paul warned that “in later times some will fall away from the faith” (1 Tim. 4:1 NWT, emphasis added). Apostasy did not mean the community of believers in Christ ceasing to exist or all of its members losing their way, but rather that some members of the church “went out from us” (1 John 2:19 NWT). Thus, the Jehovah’s Witness belief that there was no true Christian church or people to be found on the earth for centuries prior to the founding of the Watchtower Society is simply unbiblical (see further the second article in this series).17 But this means in turn that the idea of the Bible having been substantially altered doctrinally throughout those many centuries is also unbiblical. Any religion that claims to believe the Bible, but then qualifies that affirmation in the way the Jehovah’s Witnesses do, is not really committed to the Bible itself. Rather, they are trusting in someone or something else, in this case the teaching of the Watchtower Society through its publications, including the NWT. The Bible is accepted only insofar as the organization has reshaped it to fit the assumptions and doctrines it considers reasonable, consistent, and believable. The rest of the articles about Jehovah’s Witness doctrine presented on this site demonstrate this conclusion to apply over and over again with regard to the Watchtower religion. 1. Jehovah’s Witnesses—Who Are They? What Do They Believe? (Philadelphia: Watchtower Bible and Tract Society of Pennsylvania, 2000, 2006), 4. Publisher hereafter cited simply as Watchtower. 2. “Foreword,” in New World Translation of the Holy Scriptures (Watchtower, 2013), 39, hereafter cited as NWT (2013). 3. “Features of This Revision,” in NWT (2013), 1726, 1729; see also New World Translation of the Holy Scriptures: With References (Watchtower, 1984), 6. 4. Does Fate Rule Our Lives? Or Does God Hold Us Responsible? (Watchtower, 2001), 6. 5. Reasoning from the Scriptures (Watchtower, 1995), 63-64. 6. “Should the Name Jehovah Appear in the New Testament?” Watchtower, Aug. 1, 2008, 18-19. 8. “The Challenge of Knowing God by Name,” Watchtower, July 1, 2010, 6. 9. Robert M. Bowman Jr., “Was the name Jehovah originally used in the New Testament?” (Cedar Springs, MI: Institute for Religious Research, 2017). 10. Close to Jehovah (Watchtower, 2014), 8-9. 11. “Now You Are God’s People,” Watchtower (Simplified Edition), Nov. 15, 2014, 29-30. Note that the Watchtower is published in two editions, one of which is called Simplified. 12. “Principles of Bible Translation,” Appendix A1 in New World Translation (Watchtower, 2013), 1720, 1721. 13. 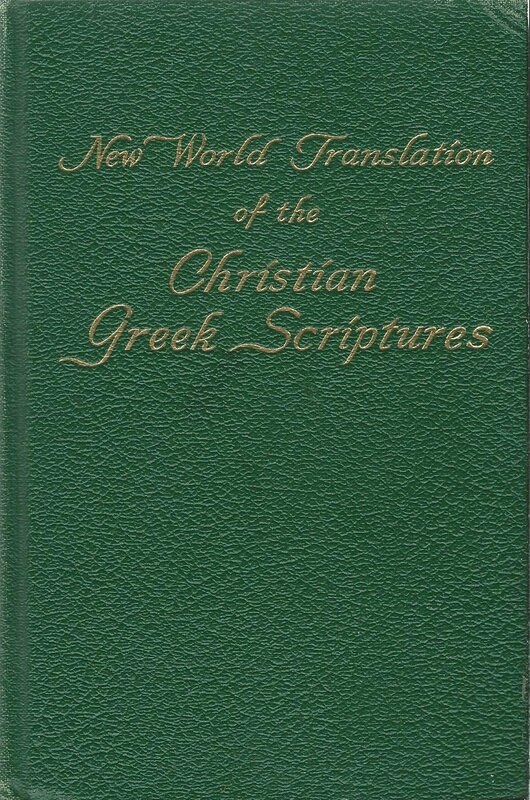 New World Translation of the Christian Greek Scriptures (Watchtower, 1950), 6. This statement is repeated in The Kingdom Interlinear Translation of the Greek Scriptures (Watchtower, 1985), 7-8. 14. Jehovah’s Witnesses—Proclaimers of God’s Kingdom (Watchtower, 1993), 608. 16. “Why You Can Trust the Biblical Gospels,” Watchtower, March 1, 2010, 11. 17. Robert M. Bowman Jr., “No true religion on earth until 1919? Jehovah’s Witnesses’ view of church history” (Cedar Springs, MI: Institute for Religious Research).